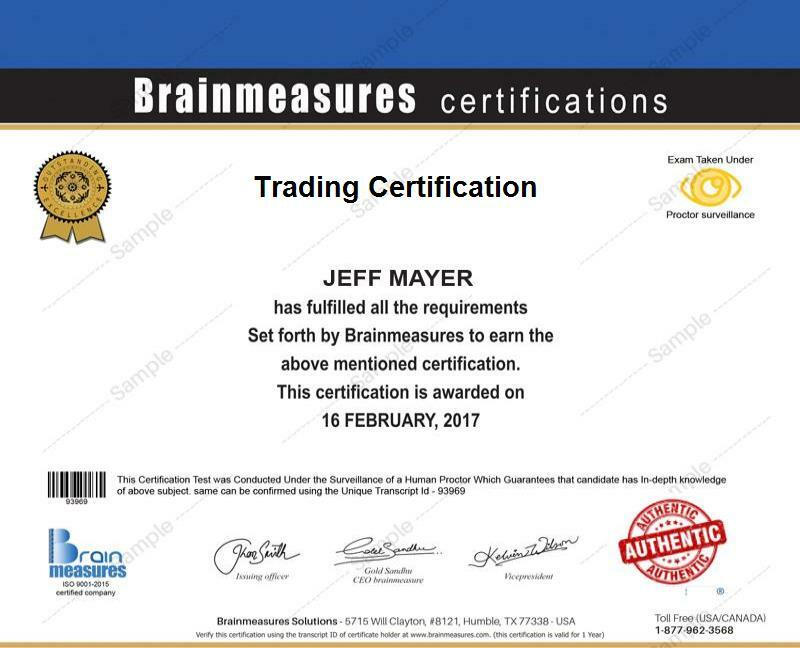 Becoming a successful and profitable trader is never impossible to reach especially after deciding to take part in the trading certification program which is now offered by Brainmeasures. Brainmeasures trading course will surely inform you about all the things that you need to learn in order to become successful in this field. This highly reputable online certification and testing company is guaranteed to offer you the most reliable trading training online which covers all the aspects related to stock trading and any other types of trading including how the market works and the many strategies that you can use to increase your chances of winning. This online certification course also provides information about all the trading tools that you can use and other sources of information that will allow you to have an easier time formulating trading decisions. But before you will be able to receive your trading certification, you will need to successfully pass the online trading exam which serves as an evaluation of your trading skills and knowledge. The trading certification program is primarily designed for aspiring and existing traders who want to significantly increase their chances of winning trades in the stock market. It is also beneficial for individuals and professionals who hold great responsibilities in private banks, central banks, commercial banks, financial institutions, hedge funds and consultancy groups since they need to know exactly how the stock market works in order to formulate the best decisions for the good of their organization. Working in the stock trading industry also increases your chances of earning a huge amount. As a stock trader, then your earnings will be fully dependent about your knowledge about trading and about all the trading decisions that you have made. If after completing a trading certification course you get a stock trading analyst position, then you can expect your annual earnings to go from $40,000 to $133,000 per year. If you are a stock broker, then your earnings would be around $47,000 to $98,000 annually and there is a great possibility that you will earn more through commissions.